Photo: Linda Shaffer, World Resources Institute. Creative Commons BY-NC-SA (cropped). 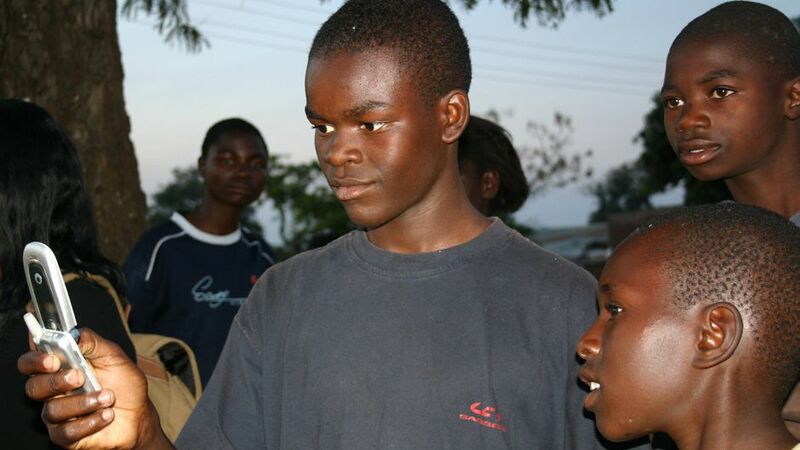 Worldwide 774 million people, including 123 million youth, cannot read or write. For centuries, such illiteracy has often been traced to the lack of books. Most people in Sub-saharan Africa still do not own a single book and schools in this region rarely provide textbooks to learners. That is set to change, according to a new UNESCO report, with mobile technology offering great potential to boost reading skills and improve literacy in developing countries. The “Reading in the Mobile Era” report, co-authored by UNU-WIDER’s Han Ei Chew, reveals that hundreds of thousands of people in countries like Ethiopia, Nigeria and Pakistan currently use mobile technology as a portal to text, reading full-length books and stories on rudimentary small screen devices. “This is important because literacy opens the door to life-changing opportunities and benefits,” said principal author author Mark West of UNESCO in this video interview. Recent data from the United Nations shows that of the 7 billion people on Earth, over 6 billion now have access to a working mobile phone. To put this number in perspective, the report notes that only 4.5 billion people have access to a toilet. Collectively, mobile devices are the most ubiquitous information and communication technology (ICT) in history. More to the point, they are plentiful in places where books are scarce. Created through an ongoing partnership between UNESCO, Nokia and Worldreader — a global non-profit organization that works to bring digital books to readers around the world — the report is part of a two-paper series on mobile reading. The other soon-to-be-launched publication, “Reading without Books”, reviews mobile reading initiatives around the world, identifying their strengths and weaknesses in order to steer the development of future projects. Together, these two reports explain how mobile technology can empower readers and further literacy in developing countries and beyond. Drawing on findings from a year-long study, the report explains the habits, preferences and demographic profiles of mobile readers in seven developing countries. While mobile phones are still used primarily for basic communication, they are also — and increasingly — a gateway to long-form text. For a fraction of the cost of a physical book, it is often possible to access the same book via a mobile device. And this capacity is not restricted to smartphones: today even the least expensive mobile handsets allow users to access and read books. Across developing countries, there is evidence of women and men, girls and boys reading multiple books and stories on mobile phones that can be purchased for less than US$30. Mobile reading is not a future phenomenon but a right-here, right-now reality, the authors stress. This study of mobile reading was conducted in seven developing countries, Ethiopia, Ghana, India, Nigeria, Pakistan, Uganda and Zimbabwe and included the analysis of over 4,000 surveys and corresponding qualitative interviews. Yet, he pointed out, to the team’s knowledge, no portal exists to let adult caregivers easily access content suitable for children and expressed hope that UNESCO can help lead in the creation of such a resource. The survey also shed light on important gender-based differences. Although a large majority of mobile readers are male (77 percent), women devote far more time to reading: 277 minutes per month, on average, compared to just 33 minutes for men. “Simply put, once women are exposed to mobile reading, they tend to do it a lot,” the report says. Both the Millennium Development Goals and UNESCO’s Education for All Goals prioritize gender equality in education, and promoting reading among women and girls is crucial to achieving this objective. Thus this female penchant is good news for literacy development. Of the 774 million adults in the world who cannot read or write, 64 percent of them are women — a ratio that persists in spite of the fact that the global illiterate population is shrinking, says the report. By providing a convenient and affordable gateway to vast libraries of text, mobile phones hold promise for improving female literacy. This is particularly so in areas where paper books are inaccessible to women due to cost, scarcity or social stigma against female education. 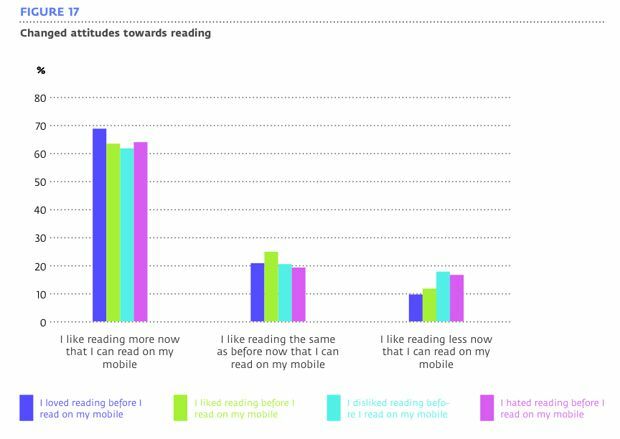 Firgure 17 from “Reading in the Mobile Era” report, shows how attitudes towards reading amongst those with different prior preferences have changed due to mobile reading. However, overall, mobiles seem to be changing attitudes towards reading amongst both genders, as shown in this figure from the report. And this is further evidenced by what Dr. Chew described as one of the unexpected findings of the study: the cost of airtime was of least concern to the respondents with only 18 percent worrying about using their airtime when reading. In contrast, 60 percent of the respondents were concerned about the limited reading content available which points to the need to make more digital content available on mobile devices. “A revolution in reading is upon us thanks to the massive proliferation of mobile technology, and future research should aim to evaluate, improve and facilitate this revolution as it unfolds,” says the report. Intended as a roadmap for governments and organizations wishing to use mobile technology to help spread reading and literacy, the report recommends improving the diversity of mobile reading content to appeal to specific target groups such as parents and teachers. It also underscores the need for outreach and training to help people transform mobile phones into portals to reading material. Of course, it also speaks of the importance of lowering costs and technology barriers to mobile reading. Mobile Phones to Prompt Reading Revolution in Developing World by Carol Smith is licensed under a Creative Commons Attribution-NonCommercial-ShareAlike 4.0 International License. You replace the code in the “”. This will then place the video in the page at the right size and allow browsers to resize it based on what device they are reading the site with.